Tips for Baking in the U.S. There are tons of baked treats you can enjoy during your time in the USA including cookies, cupcakes, and brownies. Creating your own baked goods is simple if you have the right recipe! 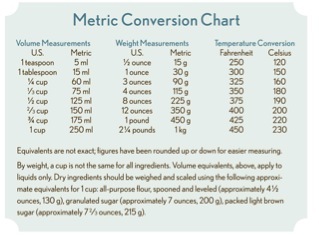 Most American baking recipes have their ingredients listed by volume using the unit "cups" and "spoons" rather than by weight in grams. You can pick up measuring cups/spoons from most stores that sell other kitchenware. How do you measure cups? Generally speaking, you will need a set of measuring cups for dry ingredients such as flour and sugar and a measuring cup for liquid ingredients such as water and milk. These measuring cups typically have markings for both the metric system and the U.S. system of measurements. The chart below is a great resource for converting units between the two systems. Measuring using a liquid measuring cup is pretty straightforward. Set the cup on a flat surface and pour the liquid in slowly to the desired marking. If the recipe calls for less than the smallest marking on the measuring cup then you will have to use a measuring teaspoon/tablespoon. These can be found on Amazon or at most stores that sell other kitchen items. Each cup and spoon has a marking on it that indicates how much of a cup or tablespoon it is. For instance a recipe may call for "1/3 cup" of sugar, you would use the cup with the marking "1/3 cup". Measuring spoons can be used for dry or liquid ingredients. When a recipe calls for a "packed" ingredient such as brown sugar it means that you will have to fill the specific measuring cup to the brim and pack it down to fit more before leveling off any extra. One thing to note is that ingredients should always be poured or spooned into a measuring cup. If a measuring cup is used to scoop out an ingredient from the bag it will pack down too densely. This is especially true for ingredients such as flour. Depending on where you are in living in the U.S. you may need to adjust your baking temperatures to take elevation into account! If you are baking at high altitudes you may need to make additional adjustments. Here are some helpful tips for high altitude baking. Let the mixture stand at room temperature for 10 minutes. The milk will curdle and slightly thicken. You can now use this mixture as you would use buttermilk in a recipe. Baking Powder: Baking soda (sodium bicarbonate) is commonly used in baking recipes all over the world, however, baking powder may not be as popular. Baking powder is a mixture of baking soda and a weak acid. Measure 1-teaspoon of baking soda and 2-teaspoons of cream of tartar into a bowl. Mix until thoroughly combined and use right away. If you're an avid baker you can continue to make homemade treats while you are in the U.S.! Baking is all about having fun and experimenting.